This is a great collection of signs and printed banners this month. 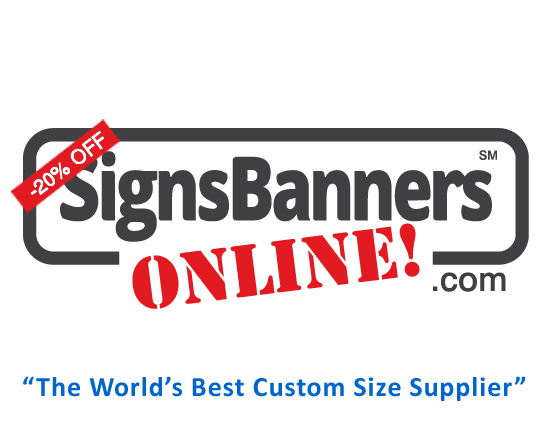 Signs Banners Online now supply graphic design firms and freelance designers in US and around the world. Images here are from their design department and they dont show their agent or freelancer orders publicly. They are a cool trade printing company and offer freelance designers a wholesale manufacturing route for the freelancer to work, manage all aspects from their cool upload to their automatic printing machine of the banner. The video shows an overview of size, color depth, process and availability of signage in US and for international freelance orders. Their expert sewing techniques, facilities and amazing industry printing knowledge shows here judging from the big banner sizes displayed. As a professional graphic designer I am very satisfied to recommend them to other graphic designers and freelance people in our printing industry. "Setting a high quality standard means graphic and creative design firms USA can rely upon a successful business line for outputting their creative printing and banner sign manufacturing... all direct from the factory". If you haven't yet tried out the new website it's well worth looking around. They have great products and its factory to you prices.